"Let us catch a killer…" Ready for more mustache? 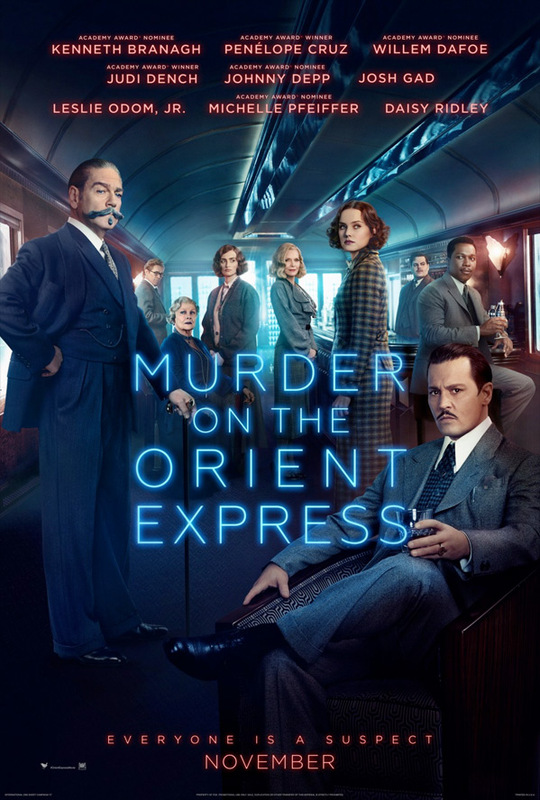 20th Century Fox has debuted the second official trailer for the new remake (or re-adaptation) of Murder on the Orient Express, the murder mystery set on a luxurious European train. Adapted straight from Agatha Christie's novel, actor/filmmaker Kenneth Branagh directs this updated version of the murder mystery, with a very impressive cast: Johnny Depp, Michelle Pfeiffer, Penélope Cruz, Daisy Ridley, Josh Gad, Willem Dafoe, Kenneth Branagh, Judi Dench, Tom Bateman, Lucy Boynton, Olivia Colman, Miranda Raison, and Derek Jacobi. This is actually looking pretty damn good, if I might say. More action and mystery and violence and intrigue than I was expecting, hopefully that's a good sign. This also has some seriously epic VFX in it, which looks great so far. You can still watch the first official trailer for Murder on the Orient Express here, to see even more footage. A lavish train ride on the "Orient Express" through Europe quickly unfolds into the thrilling mystery of thirteen strangers stranded on a train, where everyone's a suspect. One man must race against time to solve the puzzle before the murderer strikes again. Murder on the Orient Express is directed by Oscar-nominated Irish actor-filmmaker Kenneth Branagh, director of Mary Shelley's Frankenstein, Hamlet, Love's Labour's Lost, As You Like It, The Magic Flute, Sleuth, Thor, Macbeth, Jack Ryan: Shadow Recruit, and Disney's Cinderella previously. The screenplay is written by Michael Green; based on Agatha Christie's novel. This is also a remake of the 1974 film of the same name. 20th Century Fox will release Branagh's Murder on the Orient Express in theaters nationwide starting on November 10th later this fall. Thoughts?